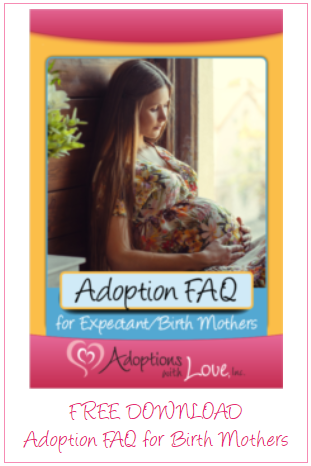 Adoption FAQ: How Much Does Adoption Cost for Birth Mothers? Facing an unplanned pregnancy can be a very emotional time for expectant mothers. There are often many fears and concerns, particularly when it comes to care and costs. Women who turn to Adoptions With Love can rest assured that all fees and expenses involving the adoption will be covered, free of charge. At Adoptions With Love, we want expectant/birth mothers to feel completely comfortable with their adoption plan. We are here to guide you every step of the way. Adoption is a big decision, and you deserve all of the support in the world at this difficult time. That is why, at a caring, non-profit adoption agency like AWL, all fees for the adoption are free of charge, including counseling and legal assistance. Some of these services extend beyond birth. If you are still wondering what exactly these free adoption services entail, you are certainly not alone. Many expectant mothers have the same question. Here, we will explore some of the birth mother services available to you at Adoptions With Love. The caring staff at Adoptions With Love offers free counseling for expectant mothers throughout pregnancy and post-partum period. We understand that this journey is an emotional one. Making an adoption plan for your baby can bring up an array of complex emotions – love, hope, confusion, grief. No mother should feel that she is alone in this journey. Even with emotional support from family and friends, it is helpful to have a professional available. Our caring staff offers support whenever you need it, 24 hours a day, 7 days a week. We continue this care for years after the adoption takes place. Adoptions With Love is here to guide you through the process of making a personalized adoption plan. This is an important step in the adoption journey. As an expectant mother, you likely have many questions. Our experienced team can work with you to design a plan with which you are comfortable and confident. When you make an adoption plan, you can choose a family for your baby and how much communication (if any) you would like to have with them. Would you like to receive email updates on your child? Do you wish to have phone conversations with the adoptive parents? Are you hoping to receive photos throughout the years? Do you dream of occasional in-person visits with the adoptive family? These are just a few of the pieces to the adoption plan puzzle, and we can help you put it all together. Most adoptive families today have some form of open adoption plan in place with their child’s birth mother. Studies show that children and birth parents involved in an open adoption are happier than those in closed adoptions. This is because of the peace of mind and knowledge that open contact can bring. However, open adoption may not be right for everyone. At Adoptions With Love, you can choose to make a semi-open or closed adoption plan. No matter what you choose, this plan is completely tailored to your needs and desires. There is no right or wrong choice. Adoptions With Love will guide you through this process and support you without judgment. In addition to making an adoption plan, expectant/birth mothers are also able to choose the adoptive parents for their child. If you would like, Adoptions With Love will help guide you through the selection process, in order to find the best forever family for your baby. We collect personal and background information from each waiting family and we visit each of their homes, so that you can ensure your baby will be placed into a safe and loving home. We also have family photo albums and letters you can look through, to learn about each family. Ultimately, it is all up to you, and you have Adoptions With Love to offer as much information as you need. Adoptions With Love will help you find medical care to meet your physical needs (i.e. prenatal care) in addition to your emotional needs. Should you need a doctor or midwife, we will help in finding you the healthcare professional with whom you will be most comfortable. We will also ensure you have access to a full-service hospital or birthing center, with a caring staff to assist in the delivery. Adoptions With Love will also cover any uninsured medical expenses upon completion of your adoption. Facing an unplanned pregnancy can feel overwhelming, not just emotionally, but financially, as well. Adoptions With Love is here to help expectant birth mothers, without the added stress of housing and living expenses. We can cover a security deposit and several months of rent. We can also assist with utility bills, phone bills, maternity clothing, and other maternity-related payments, as necessary, during your pregnancy and weeks after birth. Expectant/birth mothers at Adoptions With Love have access to knowledgeable attorneys who specialize in adoption across the United States. No matter where you live, we will help you understand your rights and the laws surrounding adoption in your state. We are here to ensure your rights as a birth mother are respected and acknowledged at all times.